World of Goo was released on October 13, 2008 for the WiiWare service, with a price point of 1,500 Wii Points, which is $15. The game was developed and published by 2D Boy, and received an "Everyone" rating from the ESRB with "Comic Mischief" listed as the only content for gamers/parents to be aware of. 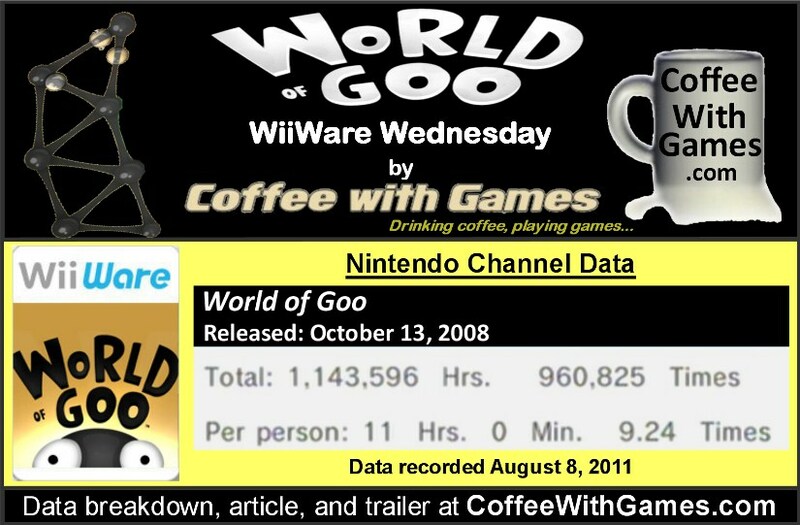 How many hours have Wii owners spent in the "World of Goo" with 1,029 days of game-play reported? Let's take a look! and not for all Wii owners that have played the game. 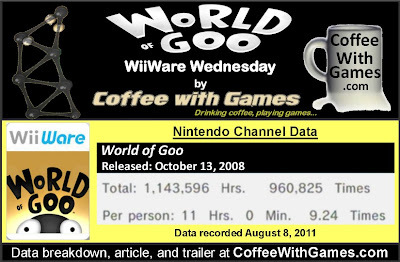 World of Goo has about 103,985 Wii owners that have reported data through the Wii's Nintendo Channel in the United States since it released. World of Goo has 1,143,596 Total Hours of game-play reported with an average play-time of 11 Hours 0 Minutes "Per person" reporting data. The game has an average play-time of 1 Hour 11 Minutes per session played. World of Goo is not currently listed in the WiiWare's "Popular Titles" section, which lists the current "Top 20" popular WiiWare games, as of checking around 5:30PM on August 10, 2011. World of Goo's United States release has made 2D Boy about $1,559,775 in almost the last 3 years since the game released, before taxes and profit sharing with Nintendo. The amount earned is based on the approximate number of players(103,985) that have reported data and the game's $15 price point, so the earnings reported here are not reflective of all digital copies downloaded. World of Goo received much critical acclaim when it released, and it has a "professional" review score average of 94.00% based on 22 reviews on GameRankings.com. I think the reported game-play data for World of Goo is impressive for a WiiWare title, especially when considering it has been released on other platforms, and as of checking Steam just now it can be downloaded through that service for just $9.99, instead of the $15 WiiWare price. Also, seeing the game with more than 10 Hours averaged "Per person" reporting data I think is extremely well for a digital game, and I think shows the game has a lot of game-play value, perhaps even more than a lot of $50-60 retail games that are released now. If any of you played the full version of World of Goo, would you recommend it to other gamers, and which version did you play? Also, do any of you think the game was perhaps under-priced with the amount of game-play it apparently offers? This game is probably the single most successful game on the wiiware, even though the majority of games are awful this seem to stand the test of time. I haven't played it because I hate physics game but I know its a top wiiware game among the likes of Art of Balance and Bit-Trip Runner. It's interesting how well that it sold. Simple + Eccentric = WiiWare sales? I have played the Art of Balance demo, and the Bit-Trip Runner demo as well. I thought Art of Balance was an interesting and simple idea, but provided some challenge. If Nintendo didn't have the stupid timed demo system, I would say to give the World of Goo WiiWare demo a try...but you can't, but I believe you can try the demo for free on Steam if you wanted to see how it plays on the PC. I think that the fact the game caught a lot of attention in the gaming media, and was released 6-7 months after the WiiWare service launched, definitely helped it. I don't know if 2D Boy purchased any advertising for it, but the only WiiWare that I know to have had an online advertising campaign seemed to have performed well. Thanks for all the comments and feedback! If anybody else has any feedback on World of Goo, feel free to add to the conversation. I picked up WoG on WiiWare when it came out (a few days after getting my wii along with art style: orbient - another cool wiiware title) and have it on Steam as well. The later levels do get crazy to say the least, but it's still a great game with lots of character. Overall I prefer it on Wii for multiplayer and the controls. I'm not sure that "party game" actually fits, but it's a brilliant group game with the right people. I also love how you get feedback from the controller when moving over a ball. I know, it sounds a bit lame, but overall brings you further into the game than using a mouse. As for the demo situation, I couldn't agree more. Hm.. Seems that someone just posted a article about that yesterday.... Their demo system is absolutely ridiculous with the limited availability. I agree, those are pretty impressive numbers for a non-Nintendo WiiWare title. FPS Friday! What Is the Wii's Most Played FPS?